This recipe is a new staple dinner for our family. Once I bought a few key ingredients, I can whip this up in 10 minutes. In a saucepan, cook peppers and onions with a little oil over medium-high heat for 5 minutes. Add chicken (if using raw ground meat, cook thoroughly and drain extra fat). Add slaw, nuts and garlic. Cook for another 2 minutes then set aside. In a bowl, mix sauce ingredients together. Pour over chicken mixture and toss well. Feel free to add fun toppings, like chopped green onions, basil, cilantro, shredded carrots, bean sprouts, and sesame seeds. 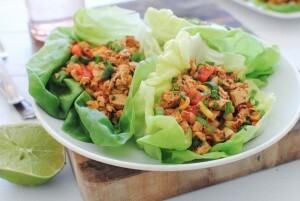 Have your lettuce wraps ready and everyone can serve themselves.